Huihui Wu, L. Ac., is a Kentucky Licensed Acupuncturist and is also Board Certified by the National Certification Commission for Acupuncture and Oriental Medicine (NCCAOM). She received her Master Degree in Acupuncture at Shanghai University of Traditional Chinese Medicine, which is one of the premier schools of its kind in China. She has been practicing acupuncture for more than ten years. She had been personally supervised and directed by many well-known acupuncture doctors in China throughout her eight-year training on acupuncture at the Traditional Chinese Medicine School and 1-year clinic practice at one of the best Traditional Chinese Medicine Hospitals. Due to her strong background in acupuncture, Huihui became a faculty member at the Shanghai University of Traditional Chinese Medicine in 2006. During her tenure, she spent considerable time at the acupuncture clinic, working at the university affiliated hospital along with a teaching program at that university. Furthermore, she contributed to a chapter in a textbook and published a number of papers on acupuncture in peer-reviewed journals. As a professional acupuncturist, she never stops learning and practicing. She has thoroughly studied a great number of classic acupuncture scriptures, such as Inner Canon of Huangdi, which is regarded as the Bible of acupuncture. It is an exceptional occurrence that a Chinese-trained professional acupuncturist like Dr. Wu is found in the Louisville area, or even in the United States. This will greatly increase the scope of medical treatment in this city. She offers you very authentic, safe and effective acupuncture treatments. 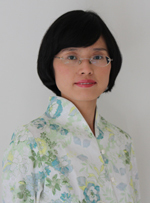 Dr. Wu welcomes people of all ages and medical conditions to her practice. She works with a wide range of health conditions such as pain conditions, chronic headaches, digestive disorders, respiratory issues, gynecological disorders, anxiety, stress, depression, chronic fatigue, obesity and a host of other disorders. A variety of acupuncture related techniques, such as moxibustion, cupping, herb, guasha, are included in her practice. She is dedicated to finding individualized treatment for her patients to provide the maximum benefit. She looks forward to helping you on your journey to radiant health and well-being. 2006-2007	Shanghai University of Traditional Chinese Medicine affiliated hospital. 2009- now Licensed acupuncturist of Kentucky state. 3. Wu, Hui-Hui et. al. (2006). Relationship between electroacupunture's anti-inflammation effect and spleen bloodflow Shanghai Journal of Acupuncture and Moxibustion. 25: 43-44. 4. Wu, Hui-Hui et. al. (2007). Relationship betweenelectroacupuncture and spleen function on leukocyte Journal of Acupuncture and Tuina Science. 5:336-340.